get away with anything now. There is video showing Ocon’s onboard and radio transmissions leading up to the crash. After watching that, I don’t even think the 10sec penalty was justified. Max should have received one instead. Usually Brawn tells it like it is, in this case I don’t think he had all the information. I'd seen the Ocon onboard previously, yes he is faster than Max, yes he is allowed to unlap himself, but and it's a big but he's not allowed to be in a collision with the race leader. That's why he got the penalty he did. Max showed as much poor judgement as Ocon in the actual incident which is why I think the stewards gave only the 10sec stop go instead of a disqualification. Race leaders must have certain expectations from lower end runners; one is that backmarkers pull out of unlapping when a shunt will result when keeping their foot in. The race leader or any podium placed car must be able to expect lapped back markers to not interfere materially with their positions during the race, surely? I also think Ocon should have apologised freely & loudly to Max in the weigh in area, after all he did change the race result with his actions, whilst he himself lost nothing. It's still a mystery to me what he thought there was to gain from unlapping himself, the tyre advantage would be over in 5 or 6 laps and many others were too far ahead for him to reach points. A driver is not allowed to drive in such a way as to prevent the following driver from getting round the corner at all, unless they have mitigating factors (such as another car on their other side, or if they are themselves already at the boundary line of the track). The regulations in this case do not differentiate between drivers who are on the same lap or a different one (in either direction), nor on whether anyone involved is in P1, P10 or P100. Esteban was prevented from getting around Turn 2 at all, in a move which would not have given him time to brake out of it. He couldn't increase his steering lock without leaving the track (which is not an option the overtaker is allowed to consider when deciding if an overtake is "on" or not). As such, the only way Esteban could be censured is if one believes his Turn 1 entry was forbidden. Since everyone agrees people are allowed to unlap themselves and nobody has raised objections to any other aspect of Esteban's Turn 1 driving, it is Max and not Esteban who has a case to answer here. I'm not convinced it was truly a stop/go offence on Max's part, but I think he should have received a time penalty (5 or 10 seconds, probably the latter). This would be in line with other errors of that magnitude covered by the same regulations, since I don't think Max intended to use his car as a weapon and it wasn't as ridiculous a move as, say, Vettel on Hamilton under the Safety Car in Baku 2017. Max then clouting Esteban just adds extra foolishness to the equation. On the basis of precedent, I agree with the stewards regarding the shoving - with the regulations as they are, a sporting penalty was impossible but a fine or "community service" perfectly reasonable. However, I believe the precedent itself is wrong-headed. For all that slugging it out used to be considered acceptable, now it is considered off-putting when encountered in junior series and indeed recreational racing. The FIA's inadvertent message is that on-track violence is fine (and indeed will be blamed on the victim) and off-track violence is a minor issue, only slightly more serious than being late for the national anthem. What she said. Totally agree. All on Max. Just out of curiosity, if Ocon DID leave the track, and the unlapping maneuver was successful because of it, would have have to 'give it back'? It's not a pass for position after all. We see drivers leave the track all the time without penalty when they're not in a battle for position, and they're rarely penalized unless they've blatantly or repeatedly cut the corner to gain time. 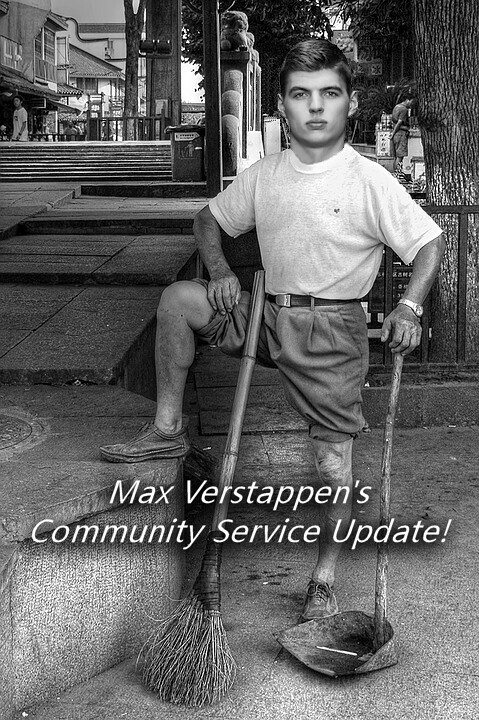 What if Max had been in a position to defend the lap by going off track? Would he have to give that 'place' up, even though there is not an actual position at stake? Just out of curiosity, if Ocon DID leave the track, and the unlapping maneuver was successful because of it, would have have to 'give it back'? Yes. The only difference being that they could have employed the blue flags to "assist" with this if there was sufficient proximity between the two drivers after Ocon's lawnmowing, instead of relying on team/race director command, as usually happens. Of course, enforcement is also subject to all the same caveats as usually applies to on-track battles! Technically, also yes. In practise... I doubt any race control would be sufficiently picky about following the rules, particularly in a race leader's case, to bother enforcing that one. May he end up working a parade after the horses pass. He'll need a bigger scoop. Hey, maybe the FIA could insert a clause, whereby, if Max is involved in a collision on race day, he has to enter the pits, get changed into Marshal attire, grab his broom and start brushing the debris off the track, before being allowed to re-join the race?? ?